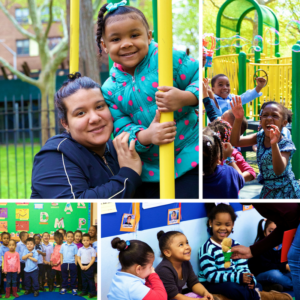 For more than 125 years, Brooklyn Kindergarten Society has provided children from working families a quality early education in a nurturing environment that cultivates the skills they need to succeed in kindergarten and beyond. Our preschools serve children ages two to four and are located in public housing in Bedford-Stuyvesant, Crown Heights, and Brownsville. BKS children receive a high-quality early education, engaging classrooms, enriching experiences, and critical family services—a quality of care and education that children from lower-income families rarely receive. In the first few years of life, children absorb knowledge at a remarkable rate. By age five, most children have built more than 90% of their brain connections—connections that will stay with them for the rest of their lives. Seventy-four percent of the families whose children attend BKS preschools are working families, yet the average BKS family has an annual income of less than $19,500. Poverty in childhood can cause lasting changes in the brain unless quality intervention efforts begin early. BKS strives to stop the cycle of poverty where it does the most harm—in early childhood. Although two of every three children who enter BKS centers test “at-risk” for developmental delays, BKS reverses this delay. Year after year, more than 90% complete the BKS program on par with or better than their peers across all socio-economic groups! BKS teachers use high-quality, research-based curricula, understand how children learn, and receive ongoing professional training. BKS is recognized by Root Cause’s Social Impact Research Report on School Readiness as one of the top seven school readiness programs in New York City (more than 1,700 programs were examined in the metropolitan area). Classrooms are designed for creative play. Children learn new skills in “interest areas,” with areas for blocks, dramatic play, music and movement, a library area, and a sand and water area. Children engage in conversations, are read to, learn songs and rhymes, and are exposed to diverse activities that expand their vocabulary and foster compassion. Enrichment programs are key to developing cognitive and socio-emotional skills, and are a unique feature of BKS. Activities include chess, gardening, the visual and performing arts, horseback riding, soccer, yoga and field trips. We recognize that families, the key to children’s success, often benefit from resources and support beyond the classroom. To that end, BKS Family Services provides counseling, referral services, and workshops for children and their families. BKS preschools operate twelve months a year, ten hours a day, unlike most New York City Universal Prekindergarten classes. A nutritious hot breakfast, lunch, and afternoon snack are served family style every day. Each classroom has three teachers. In every class, there is at least one Spanish-speaking teacher to meet the needs of our early language learners. The city relies heavily on organizations like BKS to make wider access to preschool possible—about 60% of UPK classes are held at private and community-based organizations like BKS. As a matter of compassion, justice, and solid public policy, BKS believes that every child deserves a high-quality education, an enriching environment, and the opportunity to fulfill his or her potential. BKS is where Brooklyn kids succeed!